"Drawing on experiences from villagers in Bengal to scientists in Bangalore, this book explores the beauty, adaptability and personality of India's most iconic garment. Banerjee and Miller show why the sari has survived and indeed flourished as everyday dress when most of the world has adopted western clothing. Their book presents both an intimate portrait of the lives of women in India today and an alternative way for us all to think about our relationship to the clothes we wear. "A new bride is unable to move from her husband's motorbike as her sari comes undone. A young man wonders how he will cope with the sari's complicated folds in a romantic clinch. A villager's soft, worn sari is her main comfort during a fever. Throughout the book, these and other remarkable stories place the sari at the heart of relationships between mothers and infants, mistresses and maids, designers and soap opera stars. "Lavishly illustrated and rich in personal testimony, The Sari expertly shows how one of the world's most simply constructed garments can reveal the profound complexities of modern India." The history of the sari links an ancient north Indian terracotta of a woman wearing this simple garment to the saris created by twentieth-century Paris designers. The essential simplicity of the sari - an untailored length of cloth measuring between four and nine meters long by approximately one meter wide is set against a wonderful variety of fabrics, colors, patterns, and draping styles. There are richly diverse regional traditions of color, pattern, and weave, analyzed comprehensively here through a six-fold division of the Indian subcontinent: the West; the East; the North-East and the Himalayas; the Eastern Deccan; the South; and the Western Deccan. Each section is accompanied by a dazzling display of sari types in color, all specially photographed. The result of many years' research, the book contains the most detailed analysis of sari design ever undertaken, with a comprehensive guide to the symbols, patterns, and motifs used, together with their origins and information about how they have evolved. Many rare and unusual saris are featured, along with photographs of the designs and diagrams of over forty sari types. A substantial reference section includes translations of more than four hundred Indian words and concepts, a glossary of textile terms, information on museum collections, a full bibliography, a detailed chronology, and a table of sari measurements. Linda Lynton, an expert on ethnic textiles, lectures extensively on the sari and other textiles throughout the United States. She has contributed articles about saris, ethnic art, Indian antiques, and travel to publications such as Arts of Asia, Fiberarts, and Asia Pacific Travel. Sanjay K. Singh is a cinematographer and photographer whose award-winning work has appeared in many publications, including Elle, Arts of Asia, and American Cinematographer. 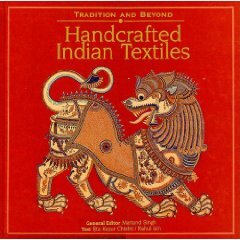 This unique book has step by step, detailed illustrations showing how to wrap 100 different styles of saris (which include men's drapes like dhotis, etc.). From the most common sari to the complicated Tamil Brahmin styles, to the little details that make a Maharashtrian sari really fit, this book shows the secrets of wearing any sari to perfection. 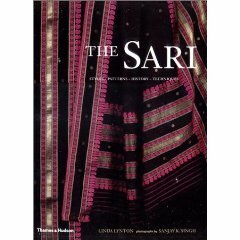 If you want to wear any type of sari perfectly, this is THE book. None is as detailed and as comprehensive. The illustrations make it easy to follow, and saris simple to drape. NOW you can buy this book directly in the sarishop. Looking in depth at textiles woven and dyed in the ikat technique, this unique publication is based on the V&A's unrivaled collection of ikats from all over India. Over 100 color plates, revealing in detail the beauty and splendor of these textiles, include many ikats which date from the mid-nineteenth century, representing aspects of this fascinating craft that no longer survive in their places of origin. Beautifully designed and authoritatively written, this splendid volume provides the essential introduction to a highly influential textile art form. Tie dyed textiles have been popular in the Indian subcontinent for centuries, and they still play an important part in the culture of Gujarat and Rajasthan. Less well-known than the zigzag lahariya turbans and ornately patterned bandhani saris of these areas are the tie-dyes of South India, Assam and Bengal. All these types are among the uniquely wide-ranging collection of the Victoria and Albert Museum and this book illustrates 140 key pieces. Handcrafted Indian textiles, steeped in tradition, are the living heritage of the glory of India. The 140 outstanding textiles represented in this book were selected from 1500. Displayed at the Visvakarma series of exhibitions, their wide-ranging vocabulary of design, technical skill and aesthetic brilliance brook no rivalry. Written and edited by renowned names in textile design, this book is, indeed, a treasure for both the textile appreciator and designer. Stunning photographs of saris, panels, shawls and fabrics, especially commissioned between 1980 and 1990 but harkening back to pre-independence India, accompany an authoritative text. This entertaining fictional work is so evocative of the life in a sari shop! Set in Amritsar, the story of Ramchand, an assistant in Sevak Sari shop, evokes the life of small town India. Ramchand's world life revolves around selling saris to the women who visit the store. Bajwa's prose captures the environment so beautifully that one can almost feel the rustling silks, the soft cotton and the slippery synthetic fabrics, as well as the hands that caress them. These two volumes are fascinating, in depth studies of these three states. The books are rare and hard to come by, but if sarees are your subject, well worth the effort and price. The authors give detailed insights into the world of the textile cottage industry and its interdependence between dealers and producers. Rta Kapur is definitely one of the most knowledgable persons in the field of Indian textiles. She has travelled to the most remote places in these three divergent states to gather information about the various weaving centers. Here we get a feeling of what life in rural India can be. An excellent book with beautiful pictures. A beautifully photographed and deeply researched work depicting the many different types of textile arts of India. The book has many beautiful photos and depictions of traditional and tribal textiles as well as the crafts people engaged in making them. It's a nice survey of the fascinating textile landscape of India. If you are interested further reading about sarees and learning general textile terminology please visit the Glossary of sari terms.